"The friendship of those we serve is the foundation of our progress"
Christmas is a special time of year when we celebrate faith, family, peace, harmony, optimism and good will towards others. 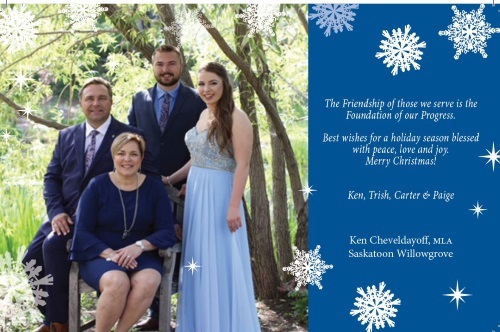 It is in that spirit that I take this opportunity of behalf of our family, Trish, Carter and Paige, to wish you and your family a very Merry Christmas and a healthy & prosperous New Year. This is a favourite time of year for many, but for several people, there are challenges. Happiness, nostalgia, excitement and reverence are just a few emotions that are experienced this holiday season. 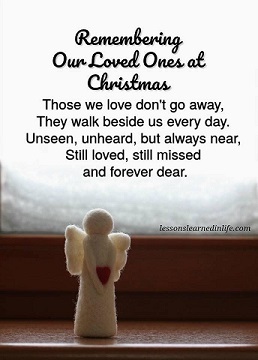 Please take a moment to help those in need and take time to enjoy your family and friends. I will always be grateful for memories of growing up in Blaine Lake, especially the small home town feeling where everyone greeting you with a "Merry Christmas" and visiting with friends and neighbours was the highlight of the season. We have so much to be grateful for in Saskatchewan. Our city and province is home to people of many faith traditions, who celebrate in different ways, but for many of us this season holds special times of sharing with family and friends. May this Christmas bring love to your heart, health to your body, peace and joy to your home throughout the new year. From our home to yours, we wish you a very Merry Christmas and a Happy New Year! Read more by viewing the PDF.